Canon certainly "got their act together" on this one - the HV20/HV30/HV40 is one heck of a good inexpensive small 1-chip HD (high definition) camcorder! The lens at the wide end is superb even at the widest f-stop, producing a very sharp image to the corners. Zooming about 1/2 way through the (marked) zoom range on the VF (viewfinder) zoom scale away from WA (wide angle) gradually introduces a touch of CA (chromatic aberration) toward the image corners, but with nothing very bad and with nothing else to complain about. Zooming to about 3/4 of the way toward the tele end (as indicated on the VF zoom scale) introduces still more CA, but it is acceptable, and sharpness, while declining a bit, is still very good. Beyond that point, the image quality declines rapidly (the CA is excessive at the long end and sharpness, especially toward the image corners, isn't all it should be). Since I prefer WA, these characteristics aren't a "deal breaker" for me and in the zoom range that I use most of the time, the picture sharpness is astonishing when viewed on a very sharp 42" LCD TV at 6.5', especially when it is compared with any SD (standard definition) camcorder output and with anything sold near the absurdly low price I paid for the HV20. The built-in microphone sound quality is barely acceptable since some undesirable camera body handling noises, lens zooming hum, and prominent wind noise can be heard in the recorded audio. Unfortunately, when adding an external microphone, the auto "wind" LF (low-frequency) cut filter cannot be enabled - and I like to shoot nature here and the wind is almost always blowing. I tried adding a stereo Sony 908C external microphone to the camera using a simple isolation bracket which solved the zooming noise problem, but I could not completely solve the handling noise problem or the serious wind noise problem even with with two layers of foam windscreens (one a Radio Shack foam wind screen, part number 33-373A) with additional multiple layers of differing types of open cell foam wrapped around them. Adding the Rode "Deadkitten" "furry" directly over the 908C's own foam windscreen (part number RD-1, the one that comes with the Rode StereoVideoMic - but it can be ordered separately for about $25) did solve the 908C's wind sensitivity problem, but it continued to be difficult to reliably isolate the mic from camcorder handling noises. Mounting the mic on a still camera "L" handle flash bracket (which also aided with hand-holding the camera) helped, but using a bracket assembly I made (described here) solved the handling noise and hand-holding problems I had been having. I tried, without success, my two mono short shotgun Sony microphones (with screens and air conditioner foam wraps) mounted at diverging angles on a bracket while using a Radio Shack 1/8" dual-mono-to-stereo adapter (RS part number 274-375, $4.99) and a RS 1/8" right angle stereo adapter to get the cords where I wanted them (RS part number 274-372, $3.99). The next mic I tried was my mono Sennheiser MKE-300 short shotgun microphone with its own foam wind screen plus a Rycote "furry" over that, all mounted on a pair of isolators to raise the long and fat (but light) microphone package high enough so that it was out of the visual range of the lens zoomed wide with the Raynox .66X WA lens converter on it. This solved all the problems except that some camera handling noises remained - but this solution introduced another problem. With the microphone's mono plug inserted into the HV20's stereo input, I got a mono audio image that hung noticeably toward the left side. I was able to achieve a centered mono image by adjusting the channel balance during editing - and also by using a Radio Shack 1/8" mono-to-stereo adapter (RS number 274-374, $2.99). I eventually replaced the MKE-300's mono plug (which did not fit sockets reliably anyway) with a stereo plug with the "hot" wire connected to the both the plug's ring and tip. I added the right angle adapter to get the wire where I wanted it and also to better protect the camcorder socket from possible damage from side force due to having a long adapter sticking out the side of the camera. Better yet, I suppose (if one of these could be found), would be to put a stereo right angle plug directly on the microphone cord (wired as above). I looked at various solutions for converting the mono sound from the Sennheiser to a simulated stereo sound, but I was not happy with any until I tried one of my own (described here), which works reasonably well. I have not tried Canon's own DM-50 mic for this camcorder, which at least has the advantages of being compact and of being powered directly from the shoe (no external signal wire is needed, and it powers up/down with the camcorder - and that mic may be useable with the $50 Rycote Mini Windjammer "furry"). Canon's DM-100 comes with a "furry", but unfortunately, it doesn't fit the HV20/30/40's hot shoe. I recently tried the new Rode Stereo VideoMic, and this mic appeared to work acceptably well in every respect, although it is relatively expensive, bulky, and heavy. This mic's response is smooth, but it is somewhat bright and it has some tendency toward producing sibilance with some voices. It comes with a reasonably effective "Deadkitten" wind filter and 8 spare suspension rubber bands. Very recently, I found my old-but-much-liked Canon ZM-100 that proved to be excellent in sound and also in its freedom from handling and wind noises (with some air conditioner foam over the mic's own foam screen). It does require an added awkward custom 6v. battery power supply box for it to work, though. If you want to hear what these microphones sound like in a rough comparison using familiar material (but without wind), go to YouTube at http://www.youtube.com/watch?v=dFQDItWK4Ng (click on the "HD" button if you care, but the visuals are "throwaway"...;-). I also have a comparison of the five microphones here. The conclusion for me is that the most reliable and trouble free microphone under a variety of conditions is the Sony 908C - but I was surprised by how nearly alike the five microphones I compared sounded. Also, I found that the HV20/30/40's AGC (automatic gain control) does not always prevent wave-form clipping distortion, although if likely clipping is noted when viewing the camcorder's audio meter, a 10db pad can be switched on in the camcorder's menu (and/or on the Rode microphone), or you can use manual audio level control. I do miss the Sony VX2000 microphone and audio which, with the Radio Shack perfect-fit foam windscreen (RS number 33-373A), was free of all problems (when using AGC) and it just plain produced excellent ambient stereo sound for me without fuss under almost all conditions. When using the larger of the two batteries that were originally available for the HV20, I heard a frequent "thunk" in the audio. I recognized this immediately as being caused by the battery moving in its mounting area - and it was cured by adding a patch of masking tape four to five layers thick to the back of each battery. The patch extends a tad short of the terminals, some short of the depression at the other end, and just short of both sides (clearing the mounting cut-outs). Afterward, I put the cap on each battery with the opening (indicating charge state) over the side opposite from the blue label and filled in the exposed area with a ball-point pen (blotting it afterward). I also added a strip of masking tape along the edge of the tape compartment, extending very slightly into the compartment. This reduces the door play, which can cause some noise as the door moves when using the side grip. Also, be very sure to switch from the default mini-plug "AV" output to the alternative "headphone" output in the menu when using headphones with the HV20/30/40! www.camcorderinfo.com/content/Canon-HG10-Camcorder-Review-33146/Performance.htm# for an interesting comparison between the image quality of the standard 17 Mbps AVCHD memory card and hard drive acquisition format and the 25 Mbps HDV tape acquisition format with camcorders using the same sensors and lenses, the Canon HF 10 and Canon HV30. The compression system used for tape is still generally preferable for image quality and for editing ease and practicality, and tape is also more practical for the archiving of video files, especially the source material. Even good editing programs like Vegas Pro can bog down with AVCHD unless the hardware is VERY able. AVCHD has a way to go yet, with only very specialized (and expensive) hardware (and/or transcoding software) able to handle high data-rate AVCHD files well, which makes me feel sorry for those who are tempted by the appealing convenience of memory card and hard drive based camcorders - unless efficient editing and easy long-term archiving are not desired. Unfortunately, the first tape I tried was a defective one, and it pointed out a potential disadvantage of using tape for HD: dropouts (and an HDV MPEG-2 dropout causes the picture to freeze for about a half second, although this is usually caused by only one or two defective frames which may sometimes be easy to work around during editing). Many people report trouble free use of standard Mini-DV tapes of various brands (and even with mixing brands, which I would never do), and I later had relatively few problems with the same kind of tape I had had many dropouts with. This experience did give me the opportunity to (painfully...) learn the differences in how three HD editing programs handled problematic HDV source material. Higher grades of tape in the Mini-DV cassette format are available, but the prices are considerably higher - but for safety I will now use tape specifically designed for recording HDV with its MPEG-2 format, which is much more sensitive to the effects of tape dropouts than Mini-DV, and I now have a supply of Sony DVM-63HD tapes (and Sony HDM-63VG has also been recommended to me as a less expensive alternative). DVD, memory card, and hard drive in-camera recording systems do avoid dropout problems, but for me, their several disadvantages may outweigh their one advantage. of 1920x1080 instead of HDV's 1440x1080). Unfortunately, the eyepiece viewfinder has been dropped from two of three of these camcorders to cut costs (this is unacceptable to me). Editing this high data rate is not easy, and requires the use of a very fast computer. Edited videos can be archived on multiple hard drives that are properly maintained, and AVCHD red-laser DVDs can be authored for convenient viewing using standard cheap DVD blanks and standard DVD writers. HDV videos can also be converted to AVCHD with very little loss in quality (with suitable software, such as Sony Vegas...) and authored using standard DVD blanks and writers, also saving the costs of Blu-ray writers and disks. These disks must be played on an AVCHD-compatible Blu-ray player for viewing, though. Manual controls can be accessed after the slider on the camcorder upper rear left side is moved from the full "Auto" to the "P" position. MF (manual focus) is done by pushing a small button next to a "roller wheel" near the front and turning the roller (the backlight compensation button is just above it). Pushing the MF button and holding it more than two seconds moves the lens to infinity focus, but only for the zoom setting already selected (any zooming defeats this setting). The "edge peaking" viewfinder MF aid appears quite helpful (accessed at the bottom of the viewing screen or in the menus) - but I found the 2X magnification option on the coarse-grained screens less useful than the peaking function alone, available separately in the menus. There are also useful "lock-and-shift" exposure and sound recording level controls (using the tiny joystick on the camera back), which serve well enough as substitutes for fully manual controls (although their operation can be very confusing). "Zebras Stripes" can be activated in the menus for the indication of areas of overexposure, and a sound level meter can be activated in the viewfinders. A microphone pad can be activated if needed for additional control over very high audio levels. for correct focus more often than when in the "I-AF" mode. Aperture Priority (you select the aperture, the camera selects the shutter speed) and Shutter Priority (you select the shutter speed, the camera selects the aperture) auto exposure modes can be selected in addition to Program Auto (the camera selects both aperture and shutter speed), and all of these can be overridden using the "lock-and-shift" manual exposure control (which I now use more frequently, judging exposure with the eyepiece VF and the zebra stripes). Some added manual reduction in exposure may be useful under almost any condition to avoid loss of the appearance of image "richness", the loss of highlight details of light-colored subjects, and the "blocking up" of detail in highly saturated yellows, oranges, and reds. I prefer using shutter-priority, using 1/60th second when shooting moving water, and 1/100th or higher for everything else outdoors unless the shutter speed blinks indicating that it needs to be adjusted to another shutter speed for correct exposure (image diffraction effects at the smallest stop available, f8, are not really a problem, and the lens is good at its widest stops). Some of the special program modes can improve the picture characteristics under specialized conditions, but I very rarely use these. My current preferences for setting the picture bias controls in the "Custom Settings" are these: sharpness always at "o", exposure always at "-", contrast at "-" on sunny days and at "o" on cloudy days, and color depth at "o" unless there are saturated yellows, oranges, and reds (then I use "-" to prevent these colors from blocking-up, removing detail in these areas). I also use color depth set at "-" when there is skin tone in the sun, or at "+" if the light and color are "flat". In addition to the picture biasing adjustments in the menus, there are also selections for smoothing skin tone and for simulating a "film look". Selecting the custom settings locks out skin tone smoothing. Using "cine mode" results in a picture that looks too flat and lifeless for my tastes (although this mode can also be modified with the custom controls and manual exposure shift). I use DWB (daylight white balance) outdoors in sunlight and SWB (shade white balance) in shady/cloudy-conditions, or I set the adjustable and lockable white balance for the best color balance, and also for avoiding scene-to-scene color balance variations. For me, the picture with the body side switch set to "Auto" mode is not what I like, but that is what the biasing controls, the aperture and shutter priority modes, and "lock-and-shift" modes are for, available with the body switch set to "P". The menus are fairly easy to operate from the single button and "joystick" on the rear (many of the options are removed unless the slider on the camcorder upper rear left side is moved to "P"). The lowest level items are accessed by pushing the button and making selections with the joystick (pushing it in to fix them). The second level is accessed by holding in the button longer than two seconds (a neat system - but sometimes confusing in practice). Other options are accessed with the joystick directly, pushing it up or down for selection, then left or right to change the settings, but I find this VERY confusing in practice, simple as it sounds. There are outputs for FireWire, HDMI, component video, stereo sound, and headphones - and a stereo 1/8" microphone input jack. I thought I would miss a Lanc input, but Canon has provided not only a nice zoom control (unusual for a small camcorder), but one with an unusually slow lowest speed available - very nice! And, there is a menu selection for choosing a fixed zoom speed (including the slowest) so that you can "mash" the zoom controller and still get a predictable zoom rate. The optical stabilizer is excellent, but since I now shake rather a lot, I also use a handle that attaches with a quick-release mechanism to the bottom of the camera. It extends far out to the left side of this small and light camera, with a folding bar attached to it that rests on my left shoulder (photos are here). Added to that are a firm grip with my right hand - and with pressing the top of the camcorder viewfinder to my eyebrow, I have four points of support. (I also have a "tank" of a professional fluid-head video tripod, but I dislike using it.) As a further method of image stabilization, I sometimes now also use ProDAD Mercalli Expert, a software stabilization program (for more on that, go here). A standard shoe for a light or microphone is also supplied on top of the camcorder, hidden under a snap-off (and easy to lose) cover (I leave it in my video gear cabinet so I know where it is...;-). Data is transferred by FireWire to a computer for editing, and some very inexpensive editing programs will now handle the HDV MPEG-2 material. The edited video can be transferred back to the camcorder for archiving on tapes, and HD disks can be made on Blu-ray blanks using some editing/authoring programs with appropriate burners (and AVCHD conversions from the HDV files can be made and written to HD disks using standard writers and DVD blanks - but both Blu-ray and AVCHD disks need appropriate Blu-ray players for viewing). Surprisingly good SD DVDs can also be made from the HDV files. For more on basic editing with Sony programs, go here. The HV20/30/40 has the usual full-auto-everything/program/aperture-priority/shutter-priority selections, but no fully manual exposure mode. Its "lock-and-shift" exposure mode can serve well enough for most manual exposure needs - but I still haven't gotten used to navigating quickly and easily the manual exposure level and sound level adjustments with the joystick (I always seem to push the control the wrong way and instead of modifying a setting, I wind up in a different function). I now favor often leaving the exposure control activated and using the eyepiece VF to judge exposure, and this has worked well. The barely adequate eyepiece VF is fixed in position and does not permit extending it or tipping it up (although it does easily clear the small battery packs originally available for this camcorder). The camcorder and VF eyepiece are (unfortunately for me) not left-eye friendly. I found it useful to put small sticky-backed bits of soft material at the VF top corners to protect eyeglasses from the hard VF surround material. The swing out VF panel screen is coarse and the apparent video image brightness changes considerably with viewing angle changes, making framing difficult and focus and exposure evaluations with it almost impossible outdoors (the HV30/40 panel is better). The HV20/30/40 VFs show quite a bit less than the full image recorded area (said to be 20% less, which makes it necessary to look carefully at what is in front of the camcorder to avoid shooting unwanted things - like your own shadow when a WA converter is installed...). Most of the various available VF grids and lines are too distracting (although using the single grey horizontal line choice may be useful when leveling the camera). Unfortunately, the camcorder's VFs do not serve very well as monitors to make reliable framing and picture adjustments on location easy, and this can be somewhat frustrating when the footage is viewed afterward (especially since modifying MPEG-2 footage in post more than once is not desirable due to the resultant loss in quality from additional compression passes). Other than using the often-OK settings given under "Picture Characteristics", above, I have found no "one set of settings does all" way to insure that most footage shot with this camcorder will be ideal (unlike with the Sony VX2000 - although much of this problem can be attributed to unavoidable differences between a good three-chip camcorder and a good one-chip camcorder). Properly setting up and using the eyepiece VF can help, especially if the "zebra strips" are turned on to indicate exposure levels in the lightest areas. Most of the HV20's controls are surprisingly awkwardly placed and awkward to use (the new HV40's assignable button may help with this). Handling the camera while taping can result in noise being picked up by the built-in microphone and zooming produces a low-level hum in the audio, but using an external microphone even with an isolation system may not solve these problems completely (starting and stopping taping, for instance, can both result in a "klunk" in the audio). Unfortunately, the "windscreen" (really only a low-frequency audio filter...) cannot be turned off in "auto" mode when using the internal microphone, and it cannot be turned on when using an external microphone in "P" mode. Making some choices locks the user out of some other choices (this is necessary for simplicity in the menu and operational organization, I guess, but....). As mentioned above, the large cover for the accessory shoe snaps off for removal, and it can be easily lost. Other covers on the camcorder are attached with material that looks stressed when it is bent to open the covers (one hopes that these hinges will last, but they do appear to be durable...). Some jacks/plugs are tiny and a bit finicky (and one cord with a tiny plug is quite stiff), although I suppose that this is necessary to permit so many connections to be made to such a small camcorder. Related to this is the unfortunate necessity for manually switching in the menus from "AV" to "headphones" since they share the same jack (although for most purposes, "headphones" can be left selected). While commendably tape based, using even the highest quality Mini-DV tape in the HV20/30/40 risks dropouts, so expensive HDV-specific tapes may be desirable (experience with this varies, and many people report reliable results with cheap Mini-DV tape). The original battery selection for the HV20 was very limited, with the two largest ones being almost identical in run time (and these did not have very long run times) but a larger one is available for the HV30/40 that will fit the HV20 (although it requires two charging cycles on the HV20 for a full charge), and a larger one yet is also available, but it blocks the eyepiece viewfinder. Also, while this camcorder may be inexpensive, the remote for it is unnecessarily tiny, weak in signal output, and the camcorder receiving end is unfortunately placed under the camcorder's lens, so the remote's operation is not very reliable. The above complaints notwithstanding, the HV20 (and HV30/40) can produce excellent image quality and acceptable-to-good sound quality (especially if a good external microphone is added), and for the money (or even considerably more), you cannot improve on its performance. 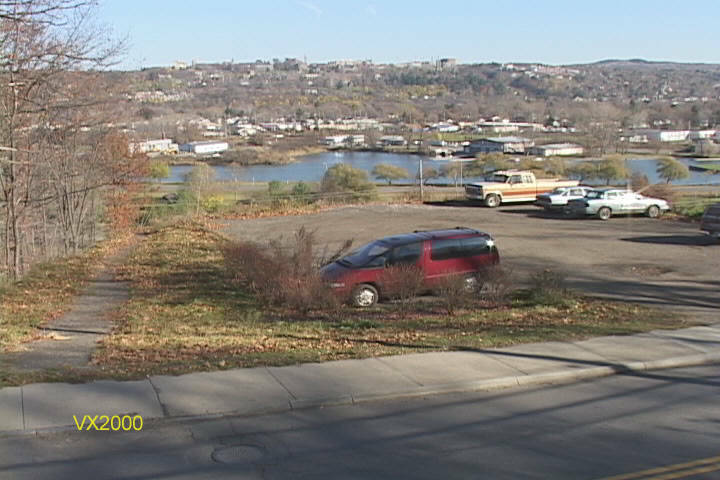 The picture quality in good light is a huge improvement over that of even the best Mini-DV (or any other SD camcorder format), and while it is well short of the very best broadcast HD, it appears to me to be the equal of "average" HD broadcast picture quality (at least when the HV20/30/40 is used in the wide angle half of its zoom range and in sufficient light levels), not a small thing for such an inexpensive and simple camera. This camcorder is amazing! at all zoom-through). The fairly light-weight Raynox (HD6600) .66X is quite good and it has the least amount of linear distortion, but it is not fully zoom-through (it is good to about 1/2 the way toward the tele end of the zoom range as indicated on the zoom scale in the VF) and at the wide end it is bettered very slightly by the Canon WD-58 in the corners at wide stops (although that one is also not fully zoom-through). (The WD-58 .7X was designed for the Canon GL-1, but it was excellent on the various Sony 58mmfront-threaded Mini-DV camcorders - see comparison frame grabs at www.David-Ruether-Photography.com/WA-converters.htm from various 58mm WA converters on the VX2000.) The WD-58 is rather large and heavy, and it has very noticeable barrel distortion on this camera's lens (see the sidewalk in the frame grab below), so I now tend to favor the slightly wider and considerably lighter Raynox .66X, which is also the only one that will accept a filter and shade (I use a 72mm UV filter plus a 72mm WA shade from the original 20mm f3.5 Nikkor lens). It may still be worth trying the $200 Canon .7X made specifically for this camcorder, but the Raynox is more than satisfactory. I did not try my Sony 58mm .7X WA or 1.7X tele lens converters since these are FAR too large and heavy for use on the small HV20/30/40 camcorders (but they are top-quality converters, and maybe I should try them just for fun...;-). Sony VX2000 without lens converter (Mini-DV frame grab at 100%). 16:9 proportion and resized to 50% for easier web viewing).